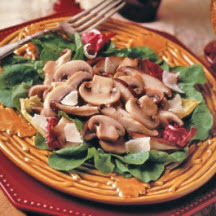 CooksRecipes has quality, kitchen-tested recipes for delicious salads featuring mushrooms as a main ingredient. 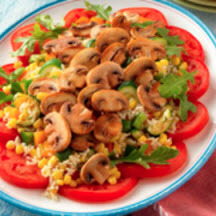 A colorful arranged salad of sautéed mushrooms, brown rice, beefsteak tomatoes, arugula and fresh thyme drizzled with olive oil and lemon juice. 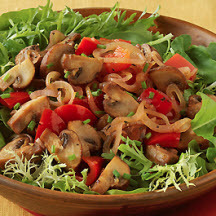 A delicious medley of sautéed mushrooms, shallots, red bell pepper and garlic tossed in a red wine vinaigrette and served on a bed of mixed baby greens. arnish this delicious salad with Parmesan curls or freshly grated Parmesan if desired.